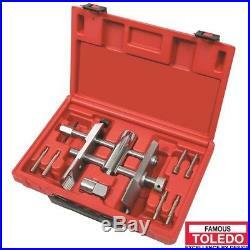 TOLEDO Wheel Bearing Lock Nut Wrench Set Adjustable. Toledo has a range of bearing and bush tools to suit many different types of applications. Adjustable wrench tool for the removal of wheel bearing lock nuts. Adjustable jaws to suit both 6 point and 8 point wheel bearing lock nuts from 45mm (1.3/4) to 145mm (5.5/8). Locking mechanism ensures jaws are rigid to prevent slipping on narrow lock nuts. Includes three pairs of pins for use on pin type locknuts. Pin diameters: 6 x 43mm x 2 piece, 8 x 43mm x 2 piece, 10 x 43mm x 2 piece. Universal tool great for Australias 4WDs. The item "TOLEDO Wheel Bearing Lock Nut Wrench Set Adjustable 311014" is in sale since Monday, December 11, 2017. This item is in the category "Vehicle Parts & Accessories\Automotive Tools & Supplies\Other Auto Tools & Supplies".